Vastu Shastra for Pooja Room: In olden (golden) days some elders stated that pooja can be done at any room of the house, but the pooja room should be constructed separately where we can pray to God peacefully and can maintain it holy. If there is no facility for keeping the Pooja Room separately, we may keep a corner or shelf as a pooja room. Now we will check the location of the pooja room in a building (or house). Please construct the pooja room as per Vastu Shastra principles. In this section we clearly shown some placements where to keep pooja mandap, puja mantap, puja dais or while doing Satyanarayana Swamy Pooja. The pooja room placement is good at Northeast(care has to taken to keep pooja room at Northeast corner of the house for this we clearly discussed on last page, so please click the learn more buttons at bottom on this page ). Pooja room is good at East, South, West and North. In some houses other than the exact North-west corner and Southeast corner inhabitants are keeping Prathimas / God Idols at remaining other places. 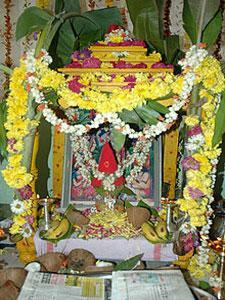 Gods / murthy or Moorthis / prathimas / idols face may be good towards East or West direction in the pooja room. Gods may be prayed by facing any direction but the faith and devotion may only counts. Most of the residents constructing a seperate room for Puja at Northeast, we should not construct room at the Northeast with more shelves and keep the Deity’s photos or Prathimas or idols and construct a platform for the idols there. This will make heavy load and block the North-east corner and the Gods will get antagonized with our decision of keeping this area to be heavy loaded. We can have open shelves and place to keep God’s pictures there or a shelf in the Northeast room can be used for pooja purposes. The North-east corner of the house should always be clean, it should not disturbed with the name of any construction, like pooja room or kitchen or toilet etc. If there is no separate room available for pooja room in our home we can use any room (except Southwest room) by placing a bench or a shelf and keeping deities there. Even in bedrooms (if no separate room is available) the gods can be arranged in a shelf but the shelf has to be covered by a screen or by closing windows (we observed this type of pooja shelves in Dubai, most of our Indians are using only one room in Dubai and there is no other way for them keeping the pooja room or shelves except in bedroom, honestly speaking there is only one room, it may called as bedroom, pooja room, kitchen, dining room, living room, family room etc.). Whenever we want to pray we can pray by opening the screen (or doors) and one should close the same, after the prayer. Any shed outside the house, should be constructed at the West or South. This will give benefit results to the residents as this evades the South and West direction. But, the construction of shed should be avoided at the East and North directions. Can we put Spiritual images / god photos frames / idols / religion wallpapers is it good to have in bedroom. Many people have this question in their mind. The simple answer is if you have many rooms, then don't put god images or photos or idols in bedroom, if you don't have many rooms, you have only one room, then where is the other place to put God images, either you have to discontinue pooja or kept God images at bedroom, which is best one. Think on this. We suggest many people, go for put God at shelf if they have only one room. In Dubai, we found many employees are living only in one room, how to do pooja if we have bedroom in one room, but they are not thinking on these things, they love God and doing prayers, hope you have the answer for the above question. Brilliant brain, keep it up. Congrats for understanding quickly. If any temple shadow is flows to one site, is that site is good to buy or not ?, generally some says that Temple shadows are bad to the sites or Houses. Now we will discuss on this point. First we have to observe in which direction the temple is located to the site/house. How much place or space the temple occupies or the approximate measurements of the temple, the tower (Temple Gopuram ) height is important. Dvajastambam height has to be eye sight calculation requires. Our interesting site/home space has to be calculation requires. The height of the building (if any) has to be counted. By seeing all the information then only we have to decide whether the site or house is good to buy or not. Without getting all these information one should not say the site/house is good or bad. 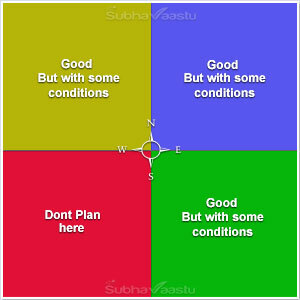 For all this the buyers has to approach one expert Vastu Consultant and then only has to take the decision. Without having consultant opinion one should stop buying the property. Here we may read temple means Hindu Temple, Christian Church, Muslim Mosque (Masjid) , all the constructions are one, God is ONE, but we divided the Great Almighty power into parts parts. The pictures and idols of Gods worshiped in the pooja room should not face the south or north(Actually its not serious, but we are giving respect to our elders voice only). The picture of Gods casually hung on the walls of the house can be facing any direction. The photos and idols of god to be worshiped in the pooja room are to face either the East or the West. The person performing the pooja should either face the East or the North. 4) Pooja room should not be opposite bathroom or toilet. 5) Pooja room should be clean and neat avoid dirt or clutter and keep it fragrant..
Know God Positions and our sitting positions while doing pooja : Click the below link to reach to learn many new things on Pooja Room Vastu Shastra. Mrs. Sumathi Srinivasan from Watford City - USA has requested to develop this vastu pooja room link, as per her request we added some more articles to this link. In this website we submit many vastu tips regarding pooja room and God Idols Position, residents pooja sitting position etc., dont miss to click the learn more buttons as we developed more in the next pages. Mrs. Sumathi Srinivasan is regularly visiting this website and giving some hints, suggestions, ideas, thank you very much Mrs. Sumathi Srinivasan for your patronage in developing this public interest vastu website. A king who did not believe in the goodness of God, had a slave who, in all circumstances, said: My king, do not be discouraged, because everything God does is perfect, no mistakes! … … One day they went hunting and along the way a wild animal attacked the king. His slave managed to kill the animal, but could not prevent his majesty losing a finger. Furious and without showing his gratitude for being saved, the nobleman said "Is God good? If He was good, I would not have been attacked and lost my finger." The slave replied: "My king, despite all these things, I can only tell you that God is good, and he knows "why" of all these things. What God does is perfect. He is never wrong!" Outraged by the response, the king ordered the arrest of his slave. Later, he left for another hunt and was captured by savages who made human sacrifices. In the altar, ready to sacrifice the nobleman, the savages found that the victim had not one of his fingers, so he was released. According to them, it was not so complete to be offered to the gods. Upon his return to the palace, he authorized the release of his slave that he received very affectionately. "My dear, God was really good to me! I was almost killed by the wild men, but for lack of a single finger, I was let go! But I have a question: if God is so good, why did he allow me to put you in jail?" "My King, if I had gone with you in this hunt, I would have been sacrificed for you, because I have no missing finger, therefore, remember everything God does is perfect. He is never wrong." Often we complain about life, and negative things that happen to us, forgetting that nothing is random and that everything has a purpose. Every morning, offer your day to God, don't be in a rush. Ask God to inspire your thoughts, guide your actions, and ease your feelings. And do not be afraid. God is never wrong! You know why this message is for you? I do not know, but God knows, because he never makes mistakes....... The path of God and his word is perfect, without impurities. He is the way of all those who trust in Him. What you do with this message is up to you. May God put in your heart the desire to send it to someone. God knows why He choose you to receive this message. Please bless someone with it. God is never wrong. Trust In God: He never cheats. Work Hard: Key for the success. Help Others: Getting blessings to your family. Be Sincere: Our life message to this society. How to chant Karaagre Vasate Lakshmi mantra - One needs to look at his palms and in the mind think that Goddess Lakshmi, Goddess Saraswati and Govinda (Lord Vishnu) is present in his palm. It is believed that the first thing a man sees in the morning determines one’s day. So I see my palm in the early morning. We all have believe in one or the another religion. The main thing of any religion is their worship place i.e. Temple, Church, Mosque, Gurdwara, etc. Do anyone wonder why we visit these all places. There is always one or the other region for these establishments. Why we all visit Temples - It is not only religious reason but also there is a scientific supportive fact behind this act. There are hundreds of temples all over India in different size, shape and locations but not all of them are considered to be in the Vedic way. Generally, the temples are located in a place where earth’s magnetic waves pass through. In simple terms, these temples are located strategically at a place where the positive energy is abundantly available from the magnetic wave distribution of north/ south pole thrust. Because of its location, where high magnetic values are available, the Main Idol is placed in the center, and also because they place a copper plate written with some Vedic scripts, which is buried, beneath the Main Idol’s placement known as “Garbhagriha” or Moolasthan, the copper absorbs the earths magnetic waves and radiates to the surroundings. Thus a person who regularly visits a temple and makes clockwise pradakshina of the Main Idol’s placement, automatically receives the beamed magnetic waves which get absorbed by his body. This is very slow and a regular visit will make him absorb more energy, known as positive energy. In addition, the Sanctum Sanctorum is completely enclosed on three sides. The effect of all energies is very high in here. The lamp that is lit radiates the heat and light energy. The ringing of the bells and the chanting of prayers gives sound energy. The fragrance from the flowers, the burning of camphor give out chemical energy. The effect of all these energies is activated by the positive energy that comes out of the idol. This is in addition to the north/south pole magnetic energy that is absorbed by the copper plate and utensils that are kept in the Moolasthan. The water used for the Pooja is mixed with Cardamom, Benzoine, Holy Basil (Tulsi), Clove, etc is the “Theertham”. This water becomes more energized because it receives the positive-ness of all these energies combined. When persons go to the temple for Deepaaraadhana, and when the doors open up, the positive energy gushes out onto the persons who are there. The water that is sprinkled onto the people passes on the energy to all. It is proved that Theertham is a very good blood purifier, as it is highly energized. In addition, temples offer holy water (about three spoons). This water is mainly a source of magneto therapy as they place the copper water vessel at the Garbhagriha. It also contains cardamom, clove, saffron, etc to add taste and Tulsi (holy Basil) leaves are put into the water to increase its medicinal value! The clove essence protects one from tooth decay, the saffron Tulasi leave essence protects one from common cold and cough, cardamom and benzoine known as Pachha Karpuram, acts as a mouth refreshing agents. This way, one’s health too is protected, by regularly There can be any other reason also in support of the facts. If you have any such thing in mind please let me know. I am sorry if I have hurt any person feeling or belief. Dear Devotees, Today is 9/11. The 11th anniversary of 9/11 world trade Center Attacks. I escaped the Hatch of death because of my Mantralaya Guru Raghavendra Swamy. I had moved to US, to start a new life on Sept 5th 2001 and my office was located on WTC Tower 1 - 86th floor. The day before 11TH September 2011, I had kept a photo of Guru Raghavendra in my cubicle and left, my boss had told me that I need to attend meeting at 8:45 am. Next day morning I got delayed because I got up late and I never leave my house/hotel with doing pooja to my Guru and hence I was doing pooja and started from my hotel at 8:45 am instead of reaching my office at 8:45 am. When I reached the Exchange Place station which is across from Manhattan (Hudson river in between), I saw the WTC (World Trade Center) building on fire, my colleague told me that he thought that a small plane had hit the building, I wanted to still make it to office, but I found out that no longer were PATH trains running into the WTC and hence I was watching from other side and saw the 2nd plane go in around 9:13 am , I was praying that all my colleagues be safe when the building was about to collapsed and finally collapsed at 10 am. I heard later from my colleagues that my colleagues walked down 86 floors and when the last employee who was an American closed his moth with kerchief walked out building collapsed behind him. I thanked Raayaru for not only saving me but my colleagues also from this disaster. Immediately I posted the miracle on our mailing list that only had 200 members then, today the mailing list has more than 13000 members and as I remember the sad day today in my life, I wanted to write to you all about the greatness of our Great Guru Raghavendra again. He is Karuna Samudhra and Dhaya Sindhu, he knows our problems and helps us like a mother will and does. Today as I sit across from the WTC site gazing at the new tower and the site, It brings to me the memories of how my Guru gave me lease of my life and saved my colleagues as well. Feel free to write your comments to me any time . May Hari, Vayu and Guru Raghavendra always bless us with happiness that we deserve. In service of Hari, Vayu and Guru Rayaru - Rajaram. It is with great joy and emotions that I share my experiences with this website. My brother, Mr. Ashok Kumar Gupta, and Bhabhi, Mrs. Veena Gupta, are visiting us from India. I requested them to make their plans in such a way so that they would be at our home for at least three Thursdays. I had a small mandir in one room dedicated for pooja and was planning to clean and change the mandir to increase the size. However, because of my work I did not get a chance to do so before they arrived on October 11th evening. On Saturday, October 13th, I requested Ashok Bhai to help me put a wall paper on the mandir frame and asked bhabhi to join us in the room to give us company and to guide me. As I was taking Baba’s statue and all the pictures out of the old temple, Udi started coming in abundance from the Baba’s big photo on the wall and as we turned to see, Om, Ram, and Shyam were written on Baba’s hand and within the ray coming out of Baba’s hand. I was in tears with joy that Baba has arrived and has blessed the project. We fixed the mandir by the night and the next day Bhabhi and Bhai left for Boston. No more Udi while they were gone. They came on Tuesday and Baba came too. There is one framed photo in the mandir, that is a photograph of Baba blessing with Udi in my bhabhi’s own mandir. There was a large amount of Udi on that photo and on Baba’s statue. Our pooja room is small and we were expecting almost 60-70 devotees for the group pooja on Thursday. We decided to make arrangement in the basement. Now we had a situation – how to move a photo with Udi on it. Ashok bhai and I carefully carried the big photo to the basement’s make-shift mandir. In the morning of Thursday we find the figures of Om, Ram, and Shyam disappeared. Bhabhi went down to the basement and prayed and, to my great joy, new figures were formed again. On Wednesday, 10/17/2012, evening a friend had invited us for dinner and we were somewhat late coming back home. I forgot to put Baba’s charan in a thali. There was no jal that Thursday. We had great Amritvani recitation on 10/18/2012. Many devotees came for darshan and Amritvani. One friend, who is a physician with a very tight schedule, showed up. She was just speechless and overwhelmed as her schedule changed in such a way that she could come to our house for darshan and Amritwani unexpectedly. Bhai and bhabhi left for New Jersey for 3-4 days on Friday, 10/19. I was anxiously waiting and preparing for the next Thursday. Again Udi started to come on Tuesday morning from all photo’s and Baba’s statue. I was determined not to accept any invitation for Wednesday. This time I put Baba’s charan’s in a thali on Wednesday night. However, there was no jal in the thali till the morning of Thursday. I was dismayed and felt that I am being punished for being negligent the last Thursday. But Baba is kind and jal appeared by 9:30 a.m. when the devotees started to come. Baba gave enough jal to be distributed to HIS devotees. This time over 80 people participated in a much powerful Sai Amritvani. I and my husband whole heartedly thank Baba and my bhabhi for blessing our house. Bhabhi and bhai will be leaving for Atlanta on Thursday, 11/1/2012, to be with their son. I am blissfully happy that we have one more Amritvani with bhabhi. Today the 10/30, Baba’s already has shown again his presence with Udi on all photos and Baba’s statue. Beautiful figures of Hindi words "RAM" and "SHAM" have been formed with Udi on the photo in the make shift mandir in the basement. I humbly beg and pray to Baba to not abandon us now. Baba: please always stay with us and guide us to the rightful ways for leading our lives. Veena and Arjun Adlakha - Columbia - USA. Jai Sairam, I am a Sai bhakth, 2 years ago i got blessings of Shirdi Saibaba in the form of 'OM' on a spoon I left in the society temple. Picture is attached. We have a small temple in our society. as Thursday is Saibaba's, day we ladies use to make some food at home n after evening Aarti distribute to the people there. One Thursday I made HALWA n took as for Prasad, to distribute I took with one serving spoon too. After aarti we distributed prasadam with the help of spoon to every one, by mistake I left my spoon in the temple n reach home. 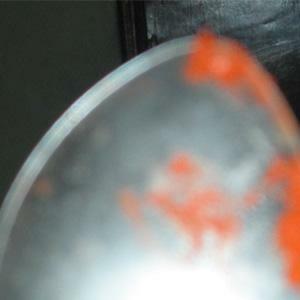 Second day i asked pandit ji I left my spoon he said yes its there kept safely . I thought next Thursday I will go to temple n then take it. Next Thursday when I went n asked for my spoon, pandit ji told its there in the shelf. For my surprise when I took my spoon I saw some Sindhur on it. First I thought may be its just Sindhur, I looked at it n found out that its "OM' written on it. I showed it to every one and clicked pictures and sent to my friends n family, all of them said yes its "OM' I was so happy to see Baba's blessings. OM SAI RAM - Beena Singh - Ghaziabad - Uttar Pradesh. What is Spirituality? Everyone have their own answer for this although all of them lead to one common point, the point where one achieves a true peace of mind of oneself. Spirituality for me means an ultimate or immaterial reality, an inner path enabling a person to discover the essence of their being. I t is a source of inspiration or orientation in life. Now another important question, what is religion? This one is easy to answer but very difficult to understand due to its depth and wide range of belief. Religion can be said as the path for the search of God and His grace. It is based on traditional ways and guidelines laid by our ancestors to be followed by the followers of that religion. Thus, on the basis of above wordings we can come across to a point that there is existence of many different “spiritual paths” – emphasizing the importance of finding one’s own individual path to spirituality. One might say then, that a key difference is that religion is a type of formal external search, while spirituality is defined as a search within oneself. The experience of ‘spirituality’; the human emotions of awe, wonder and reverence, are also the province of the secular/scientific, in response to their highest values, or when observing or studying nature, or the universe. Although, this post of mine will not be able to answer all of the questions and doubts of everyone as both Spirituality and Religion are very wide topics and their knowledge is non-ending. Even the Gurus are in search of their complete knowledge but have never succeeded to know all. Please give your valuable views and suggestions to lighten more on the concept you believe is correct of the two. Please pardon me if I have unknowingly hurt anyone’s feeling or belief and correct me if I have said something wrong. Many residents asking about Satyanarayana Swamy Pooja and placement of God in which direction. We have observed that God facing to West and people who perform pooja has to face East is good. So entire Satynarayana Swamy pooja mantapa will come towards East, so God is facing West direction, residents who performing pooja facing towards East direction. In many places we have observed this same system. We found Guntur, Vijayawada, Tenali, Ongole, Kurnool, Visakhapatnam, Bangalore, Chennai, Hyderabad, Warangal, Raichur, Mantralayam, Kadapa, Nellore, Coimbatore. We did not find any where God seeing other direction except East. Remaining is your interest. Here residents have placed Satyanarayana Swamy God towards North area, here God is facing towards South direction and residents facing towards North direction. Personally we have visited this place and noted information. Some archakas having their own opinion and placing mantapa towards South or West, so here Swamy is facing towards East or North and residents are looking towards West or South. Now coming to final point, we have clearly noted one point is that in many places Swamy is facing towards West and residents are facing towards East. Here we concluded many archakas opinions. Remaining is your discretion. Some residents asking questions like is the sliding door is good for puja room, yes its accepted. Many houses may have sliding doors for their pooja rooms due to lack of space or place we should invent some new things and has to amend in our properties. The sliding door is not an mistake to keep to our deity rooms. Don't worry. Many residents are asking about making pooja room in kitchen, is there any problem to make like that. Now we have don't more space to plan a separate pooja mandir in our house particularly in apartment flats, for them, it may be suggested to go with puja room in kitchen. Some residents also raising questions that "We are non vegetarians, is it bad to keep puja room in kitchen". People has to think on this point. They may leave non vegetarian food preparation in kitchen or they may not have any pooja room in their home, which one is easier to follow. Can you live without pooja mandir in your house, answer in short way is keep puja temple mandir at kitchen, but arrange door for it. It its not possible to make door, then arrange one curtain atleast or forget about pooja mandir or search for any other good place to keep God idols in your residence. Question from a Vastu Website Visitor? Dear Sir, there are 2-3 vastu defects in our house. local vastu consultant suggested to demolish them. I want to try vastu correction without demolition. Is Srivastu Chowki or Vastu Dosh Nivarak Sri Yantra or Meru Chakra is all-in-one vastu Yantras that rectify all vastu defects inside and outside the house? I got this info from internet. (This Srivastu Chowki or Yantra is not suggested by the local vastu consultant.) can it used without analysis of the floor plan of the house by the vastu expert? If yes, Can anybody any religion or caste can keep or use it in the house? Is there any side effects or bad effects of using it? - Jaya Prasad - Bangalore - Karnataka - India. Dear Jaya Prasad Ji, Yantras will work, but the truth and fact is that from where you did get yantras is the biggest question here. If Yantras were served to you by any seer or Matt pontiff then they will work. Many people in our society now selling bogus yantras, it is their business. So first check the system whether they performed systematic procedure to prepare yantras or not. Most of the cases these yantra providers never do any procedure performances. Providing Yantra means, it took lots of time to do poojas, mantra japa etc, otherwise they never work. After getting the yantra also one should be careful in doing the regular kriyas otherwise the power of the yantra may not rejunevate - Narayana. Which is the good place for pooja room in a house? While doing pooja which direction sitting brings luck? Need to God's cellphone wallpapers, which link provides it? Which direction should the idols of gods be facing in a home? Who is the best vastu consultant in Australia, need consultancy services? Which link is having Mantralaya Guru Raghavendra Swamy miracles pdf book? Sir, our pooja room location is on south east corner. The door of pooja room is facing north, how can I place the idols. I offer prayers to idols of a few gods. I was keeping Saibaba idol and chanting the 108 names of Baba. But I read that we cannot keep the dead people along with the other gods. Please confirm if I can keep Saibaba along with other gods. dear sir,i want to ask in which direction should i hang photo of panchmukhi hanuman or which direction should panchmukhi hanuman face? I would like to know if we can place the Idol and the mandhir on the south east side in the prayer room. Thank you. Hello sir... Recently we bought lakshmi idol( 8 inches height and made out of brass ) to worship on varalakshmi pooja festival..My question is can we worship and place the idols at pooja room..?? some says we should not worship idols at home..
My mandir is on the west wall with god idol facing the east how good is it ? We have a pooja room in south east side ( back of the temple is south facing north, House entrance is east side ). I read its not a good practice . Is there a remedy to cure that coz we cannot have temple anywhere else as we build a almirah just for pooja. Hello, I have 2 pooja rooms in my house. Can we keep two places to worship in one house? please suggest. Sir my home pooja room's wall is attached with our neighbours toilet is it bad we placed another marble temple in our poojaroom. Give us suggestions. Can we construct a room/ shop over underground water tank at personal house.